The night before we left Taihuai it snowed a couple of centimetres. 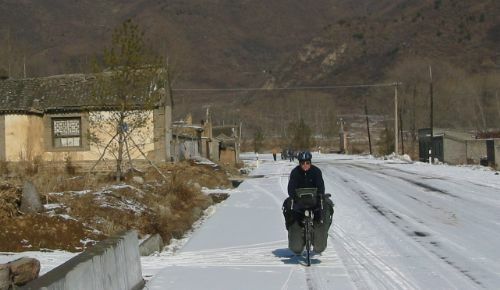 While this made the roads a little slippery for cycling it did give us an opportunity to see a Chinese snow plough in action. For a distance of 20km the road was lined with men with brooms (particularly where the road was in shade and the snow would freeze to ice) - literally sweeping the snow away by hand! 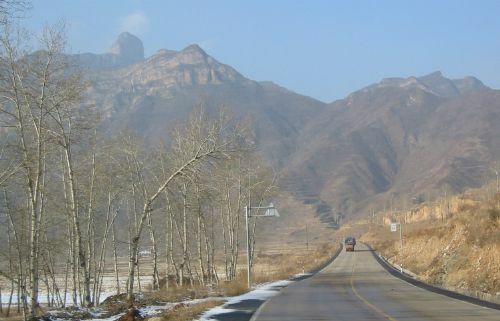 We crossed a big highway near the town of Xinzhou and headed west towards more mountains. That night we stopped in a village and asked a small group of people if they knew where there was a hotel. "Here" they said, gesturing towards a doorway leading into a courtyard. A lady showed me a room inside with a stove and two beds, an old man in bed in an adjoining room seemed friendly and the price was an amazing 50p each for the night. Later that evening we discovered that the building was actually a hospital and during the night it became clear that our companion was suffering from something nasty, probably TB. I have never heard such horribly fluid coughing, but as our room had the shared stove we couldn't even close the door! The next town we stopped in gets the record for the biggest crowds of onlookers. People here had clearly never seen foreigners before and they all wanted to see exactly what we were doing. We were followed everywhere, when we stopped to buy street food a crowd would form around us, jostling and telling the seller to overcharge us. We went into a mobile phone office to make an inquiry and were followed in by thirty people who all stood staring while we tried to communicate with the sales girl. 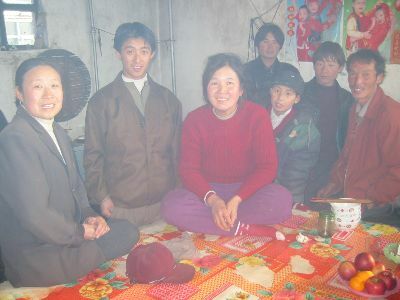 In the next town we met a student who invited us to stay with her family when we passed through their village the following day. They were very hospitable, they gave us a meal of something similar to chips and showed us how to eat sunflower seeds. Naturaly everyone in the village wanted to meet the foreigners and their tiny kitchen/living/sleeping room was packed the whole time we were there. Heading down towards the Yellow River we followed a tributary with beautifully terraced hills above it. The crossing of the Yellow River was quite odd because the only bridge had been barricaded at both ends with scaffolding and bales of straw. Trucks and cars were being ferried across the river, while buses simply terminated at each end of the bridge and their passengers walked across to another bus on the other side. With some help we were able to manouver our bikes over and through the barricade and cycle across. I have no idea why a bridge that appeared big enough at least for cars had been closed in this way.